July 2012 Budget Roundup = +$7409.54 or an increase of +3.62% | Save. Spend. Splurge. I did buy 2 white blazers (am thinking of returning one, but am waiting for the other to arrive in the mail before I decide which one… if at all), 1 navy blazer (classic! ), a skirt on SALE I’ve been coveting for ages, and a dress which I am not sure I am keeping yet. Update: This is what happened. I returned the dress, didn’t receive one blazer because they were out of stock and I am about $300 richer. 🙂 You can read about What I bought July 2012 here. Okay, so it says: $11,768.22 in the chart but that includes my retirement savings, which aren’t really my base expenses. With my taxes of around $2000, I spent about $5500 on stuff. Food stuff. Medical stuff. Tailoring stuff. Face stuff. Stock market went up quite nicely this month. I put more of my savings into investments. This video made me think about how populated the world is becoming, and about sustainability in general. Polar bears, tigers, and other common animals that we’re used to seeing in books and on TV are now considered endangered. A day WILL come where we will have to explain to our children or our grandchildren about how there used to be an animal with stripes called a tiger, and there was a bear all in white that lived in snow. 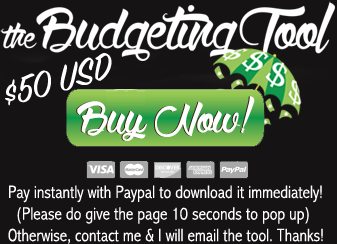 I’m taking the plunge and purchasing your budget tool! Wish me luck! We sold our home (broke even) and are going to rent for 2 yrs while we kill our consumer debt and save to build a home!!! Good luck and thank you!! Let me know if I can help. Oh, my gosh! That first picture completely sums up today for me. I have been planning on getting this one certain shirt and it fiiinally went on sale and I went to buy it and then was like, “But that means I have to spend the money!! !” But it is a shirt that will replace several other not-as-good shirts in my closet, so I’d rather have one Really Good shirt instead of several crappy ones. Overpopulation definitely freaks me out. Nice job this month!